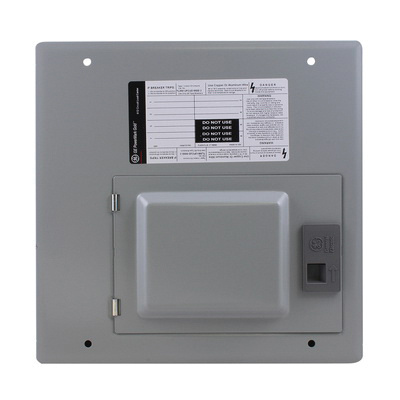 GE Industrial PowerMark Gold™ Standard convertible main loadcenter is an enclosure specifically designed to house the 12 THQL/THQP branch circuit breakers and wiring required to distribute power to individual circuits. It is rated at 120/240-Volt AC and 125-Amps. The 1-Phase 3-Wire loadcenter has interrupt current rating of 65-Kilo-Amps. It features rugged copper bus and galvanized steel enclosure for added protection and reliable operation. Flush mountable loadcenter allows wire to feed from top or bottom. Solid neutral of this load center, allows for quick, easy and secure terminations. It has a dimension of 11-1/4-Inch x 3-1/2-Inch x 11-1/8-Inch and temperature rating of 60 to 75 deg C. It is perfect for use as service entrance equipment. Loadcenter is UL listed and CSA certified.